This week Nick Haseler walked the same corridors as his father before him, here in Hereford. This in itself is not unusual, but Nick had travelled half way round the world to come to Hereford Cathedral School, his father’s alma mater, to see where his father started to write war poems in 1916, whilst still a schoolboy. 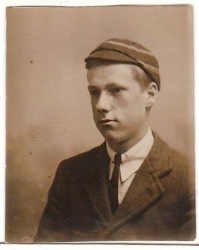 Digby Haseler left Hereford Cathedral School in 1917 to join the KSLI and then saw active service in France until he was wounded by shrapnel that pierced his helmet on 11/11/1918. Throughout his time at School and in France, Digby wrote poems which were published in small volumes at the time to raise money for the regiment and later in an anthology alongside those of Sassoon, Owens and Brookes by Cambridge University. This year Hereford Cathedral School’s award winning Cantabile Girls’ Choir, chose one of the poems and commissioned well know composer Michael Neaum to set it to music for them. They will premiere the work at the Military Charities Concert in Hereford Cathedral on 18th October 2014 where they will be performing, for the second year in a row, to help raise money for local military charities. Digby’s work will feature in Hereford Cathedral School’s Evening of Words and Music for Remembrance on 11th November 2014 at 7pm in Hereford Cathedral. Admission is free with a retiring collection for The Royal British Legion Poppy Appeal, whose standard bearers add to the atmosphere of the occasion.